How unexpected! And cool! 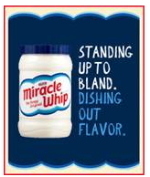 Not sure I would have thought something like this would come from Miracle Whip but its make sense. Add flavor! Takes me back to when I was a kid and eating my mom's sandwiches. I love Miracle Whip! The comment above sounds fishy to me. Unexpected and cool? It's just a headline and a jar. If you're referring to the Zingers, then maybe.